It also ignores how New Girl is not at all about being the kind of person “who don’t need no man”. Instead, this show demonstrates how relationships lead to personal growth. It also shows how every person sits somewhere on a spectrum between sensitive and stoic, and how both of these traits are essential to becoming a healthy individual. Look at the last two episodes for an example of this. In “Coming Out” (S04E13), Jess becomes concerned about how her coworkers may view her relationship with another teacher and, consequently, makes a poor decision based on these concerns. In the end, Coach and Cece remind her that she can’t let her sensitivity prevent her from doing a good job. While this episode explores how Jess needs to manage her sensitivity at work, the very next episode (“Swuit”, S04E14) details how a lack of sensitivity can be just as detrimental. “Swuit” explores how men can be hampered by the societal pressure to “be the boss” at all costs. It is Jess, guided by her sensitive nature, who leads Nick and Schmidt into a more effective business relationship. Here’s the thing, though- stoicism, toughness, will, ambition, aggression- these are not things women should aspire to because they are “manly” traits. They are things which everyone should aspire to because they’re good traits. While there’s absolutely a place for sensitivity, sentimentalism, and whatever other so-called “feminine” traits get thrown around. But these typically aren’t the traits that are associated with humanity’s greatest accomplishments. I don’t think it was Gordon’s intention to present masculinity as more valuable than femininity, but by ignoring the long history of gendered personality characteristics his critique feeds into that very value system. As Frederic Jameson would say, we must “always historicize!”. 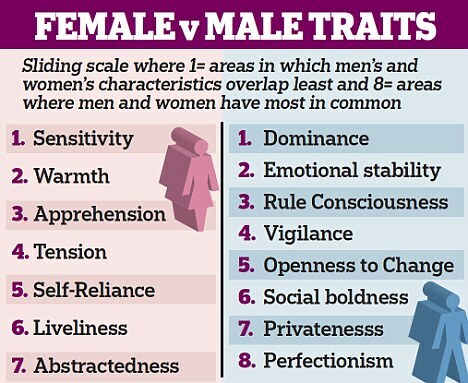 As long as these sort of charts are floating around people are going to assume certain traits are female and others are male. Calling sensitivity a so-called “feminine” trait” suggests that there is no scientific link between women and sensitivity, only a socially ascribed link. Ideas of femininity certainly are influenced by culture, I’m not arguing against that, but there is some degree of biological influence that we don’t get to ignore just because it is inconvenient. Women have a higher rate of estrogen. Estrogen is medically linked to “emotional well-being”. Men have a higher rate of testosterone, a hormone linked to higher rates of aggression. I believe every person falls somewhere along a spectrum of personality characteristics, somewhere between the level of emotionality we typically associate with women and the level of aggression we typically associate with men. I strongly believe that the two sides of this spectrum are equally valuable. Different traits may be more natural to different individuals, but I believe that is what allows us to create powerful teams: a body with a variety of parts that work uniquely and all have something to contribute. Civil rights weren’t won with meekness. Polio wasn’t cured by passivity. Great novels aren’t created through submissiveness. In section one, I touched on my frustration with words like “meekness”, “passivity” and “submissiveness”, words that neither I, nor Deschanel mentioned, and words that generally carry a negative connotation. Yet in spite of these words, I can read that statement and still say it’s wrong. Civil rights was influenced by “meekness” in the form of nonviolent resistance. Polio was cured by “passivity” in the form of nurturing nurses and midwives. 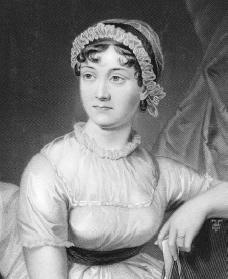 Great novels were created through submissiveness by women who were passionate about writing but continued to live in submission to their fathers and brothers. The main reason why I don’t believe in the Warrior-Princess Ideal is because I don’t believe we live in a binary world. We are each an amalgamation of different characteristics. Those characteristics have positive and negative elements, and may be not all be applicable in the same situation, but they are not innately good or bad in themselves. Cece: If you were a man dating someone at work do you think you would be worried what everyone else was thinking? Jess: That’s not me, I care what people think, I always have. Cece: Then your only option is to go on being yourself, you just got to own it. This entry was posted in feminism, history, television and tagged aggression, always historicize!, binary, caring, Cece, characteristics, choices, civil rights, Coach, continuum, crying, damsel, ditzy, emotion, emotional, emotional well-being, emotionless, estrogen, evidence, feminine, femininity, feminism, film, girly-girl, great leader, growth, healthy, Jessica Day, job, leadership, male-centric, masculine, masculinity, movies, New Girl, nonviolent resistance, novels, nurturing, pathologically neurotic, polio, professional, relationships, Rosie, scientific evidence, self-acceptance, sensitivity, stoic, stoicism, strong, submissive, testosterone, toughness, TV, Values, warrior-princess, weak, will, women, Zooey Deschanel. Bookmark the permalink. Wow I highly disagree. I think where Gordon was coming from is that if you look like traditional views of femininity and masculinity, femininity is seen as the opposite of masculinity and weakness and submissiveness are traditionally feminine traits, so even if neither you or Deschanel listed them by saying traditionally feminine traits you envoked a whole list of traits that we as a society agree are feminine and you don’t get to pick which traits go on the list–Gordon provided a counter example not a strawman argument. If I say “family is one of the most important things to the characters in Harry Potter, both Ron Weasley and Draco Malfoy demonstrate this” and someone responds “well, Hermione abondoned her family so clearly family isn’t important to her”, that’s not a straw man argument just because I didn’t mention Hermione in my original comment (me not mentioning her doesn’t mean she’s not a Harry Potter character, just like you not mentioning that she’s), it’s a counter example. Hi Nicole, thanks for your thorough response. I’m going to respond to your points as best I can, but I think I should also point you towards Gordon’s response to this post (where he clarifies some of the points in his first piece). You will see from my comment that we eventually came to pretty well agree. a) strawman – I was arguing that by only using words with a negative connotation, Gordon was setting up the idea of femininity innately negative. I’m not entirely sure how your Harry Potter metaphor transfers over to this circumstance, but I’m assuming you mean that I can’t throw out all the negative connotations with femininity any more than Gordon can throw out all the positive ones. To that, I would say yes, you are right. I need to be aware of the negative connotations with femininity. That said, I think there is something to be said about “reclaiming” femininity, as something that can represent its own unique kind of power. You can see this a lot with midwifery culture, for example which celebrates things like menstruation and pregnancy, things which were taboo with previous generations. b) I agree, negative traits often are associated with women. Then again, I think often times we look at a given trait and assign it a positive or negative value based on our cultural (in this care patriarchal) values. In my original article I was trying to challenge the way our society has stripped value from being empathetic/emotionally. I was trying to argue that their is an innate value to emotionality, and that maybe we should be celebrating it rather than trying to squelch it. c) I agree, passivity isn’t the best word to describe non-violence, and passivity isn’t the best way to describe nursing, etc. However, for this article I was trying to demonstrate the way that the words we use for certain traits can give those traits a negative spin, whereas we could use different words for the same trait and it would be seen as positive. In this case, I was trying to highlight the way Gordon was using words with a negative connotation to describe femininity, when he could have used similar words with a positive connotation that also tend to be associated with femininity (ex. gentleness, kindness, etc). All in all, I would refer you to Gordon’s final post on the subject. I felt like he did a great job of bridging our two opinions and providing a happy medium. Oh, and it certainly wasn’t my intention to argue for a binary, instead, I think we all lie on a spectrum of feminine and masculine characteristics. Or you could just say characteristics, and forget about the gender part.